These seven attractive cottages have been skilfully converted and reconstructed from 17th century barns set in picturesque countryside on the outskirts of the small village of Runcton Holme in West Norfolk, near the farmhouse on a working farm. Whilst retaining the charm of many traditional features and interesting farming memorabilia, they offer a high quality of comfort, rural views, fishing in the farm reservoir, farm and river walks, a games room with pool table and table football, deluxe hot tub/spa, a sauna, a children's play area and an outdoor swimming pool heated May to end of October. This is an ideal base to explore the variety of attractions in and around Norfolk and perhaps do a little walking, cycling or bird watching. 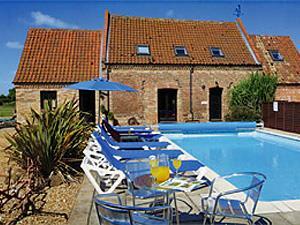 Thorpland Manor Barns are peacefully situated on the edge of the fens yet easily accessible to the A10, shops, Post Office and pubs are within 2 miles. On a bus route to Downham market and King's Lynn. The nearest train stations are Watlington, Downham Market and King's Lynn on line to King's Cross London. To keep the cottage atmosphere the 'Barns' are furnished with locally crafted solid pine furniture and all the rooms are attractively decorated. All beds are made up ready for your arrival and bath and hand towels are provided but please bring your own towels to use around the swimming pool. Cots and highchairs are available free of charge for children under two years of age but cot linen, pillows etc.. are not provided. All the cottages are very well equipped with colour TV, video, microwave, washing machine, tumble dryer, fridge/freezer, dishwasher, iron, radio alarm clock and hairdryer and have there own outside BBQ and patios. Two of the cottages have a downstairs bedroom and wet room suitable for people with disabilities. Facilities for children: swimming pool, table football, pool table, sauna, hotub, children's play area all on site. Fishing close by. All enclusive of cottage booking price. No extras to pay. Children welcome from any age. From Downham Market roundabout take A10 towards King's Lynn to small village of South Runcton (approximately 3 miles). Turn left signpost to Runcton Holme. Drive about 1 mile to crossroads. Turn left into Downham Road. Drive approximately 0.5 miles. Entrance on left. From Downham Market - 4 miles Taxi. The car parking area is gravel but drop off area and paths are level block paving.